Bringing a new revolutionary design to switching devices and equipment. Introducing a user-friendly development environment to support manufacturing processes. The 2nd generation capacitive touch solution to lower hurdles in capacitive touch sensor development. People now interact with machines through human-machine interfaces (HMI). In this field, as the adoption of capacitive touch interfaces expands rapidly, the use of conventional mechanical keys with limited functions are effectively being replaced. Panels with user-friendly designs can be operated using actions such as finger touches and swipe motions. Capacitative touch technology allows even devices designed for complex and highly skilled operations to be controlled with intuitive finger movements. As the capacitive touch operation scene expands, panel sensitivity and high-noise resistance have become key requirements in achieving accurate switching movements and sophisticated operational performance. There is also a demand for features involving environmental tolerance to water, dirt, or temperature variations. In addition to these requirements, development periods and costs are also hurdles that need to be considered and overcome. We, Renesas Electronics Corp., are ready to offer revolutionary solutions to achieve breakthroughs in this field. 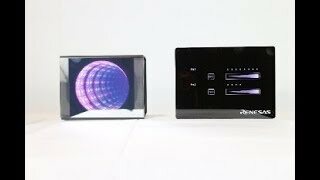 Click on the video below to experience our advanced technologies and be amazed by the high-level functions and high performance of our capacitive touch panels. Evaluations may be started immediately after purchase of our capacitive touch solution products. Keys are detected well without malfunctions despite exposure to running water. Wood, stone, cloth, and paper may be used as cover panels of capacitive touch sensors. 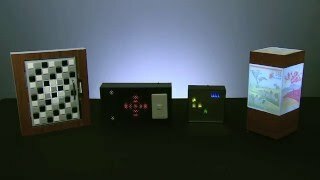 LED dimming remote control using Bluetooth® low energy and a touch panel that displays characters. 3D gesture demo applies Renesas' capacitive touch solution to realize an HMI that detects gesture motions (up and down, left and right, and forward and back) of a hand in three-dimensional space. This is an HMI (Human Machine Interface) Solution Kit mounted with an LCD segment display circuit, sound reproducing circuit, capacitive touch circuit, etc. It can facilitate the development and evaluation of HMI and USB-applied products such as electric home appliances and healthcare products with built-in communication functions. 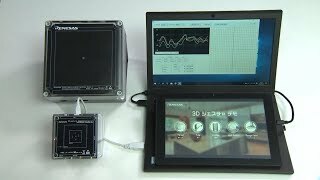 The RX 130 Capacitive Touch Evaluation System is designed for easy evaluation of capacitive touch solutions offered by Renesas. As the board and software are included in the kit, evaluation may be conducted immediately after purchase. Workbench6 (See Note*) allows for easier sensitivity adjustments. (Note) Workbench6 is not included in the evaluation kit but may be downloaded directly from the website. N.B. To download Workbench 6, please complete the user registration process on My Renesas. The 3D gesture demo applies Renesas' capacitive touch solution to realize an HMI that detects gesture motions (up and down, left and right, and forward and back) of a hand in three-dimensional space. Standard version (160 mm sq.) and small version (80 mm sq.) are available.